That tends to be true whether you're referring to either the good or bad things in life. Thankfully for me, well for today at least, it's been raining in the best way possible. After months and months of job hunting, various temp jobs and coming to terms with the possibility that my luck may just be running out and I'd be stuck moving back to Texas, I finally got offers. That's right. OFFERS. Two job offers in one day to be exact. I could've never imagined that happening. Both are amazing offers that people would kill for. Two major corporations that are well-known and respected worldwide, CBS News (The Early Show) and the Four Seasons (Magazine). I've been freelancing at The Early Show since late October as an assistant to one of the anchors and today my boss asked me to come on full time. She's absolutely fabulous. I really do love her, she's a great person and a joy to work with. My fear with this position is that I don't know what a it could lead to in the future. The other position came about when my old boss from Modern Bride & Elegant Bride Magazines was recently hired at the Four Seasons Magazine. This position seems to be everything I've been looking for. Technically, I'd be a sales assistant. I'd also have the opportunity to be coordinating promotional events (such as the magazine's shows during NY Fashion Week), working closely with the sales director and publisher on creative marketing strategies and assisting the editor-in-chief with projects as needed. Based on that alone, and especially when you throw in salary, benefits, etc., my decision is obvious. It's just difficult for me because I feel like I will be letting down whichever one I don't choose. And one of the things I hate most is that feeling that I've let someone down. But, as my friends say, this is one of the times when I do need to think about what's best for me, which is something I'm not used to doing. I guess that's just one of those things that comes with being an adult... It's a crisis of possibilities! "Truthfully, I think you've got a really good grip on the situation... let's just call him the 'situation'"
"Well, I won't be gripping THAT situation for awhile... or ever again haha"
- And this one is an original. Legit convo between friends. Earlier today, John Mayer shared a few insightful tweets regarding male behavior. "Why men are confusing: first order of business, separate the men who mean well from men who don't think about meaning well." "Now, men who mean well are the most infuriating. Assholes are easy. Mean-well-men are the most destructive types." "Mean-well men are in the business of making others happy before their own needs." "Those needs never surface until they explode in a seemingly out of nowhere outburst of selfishness." I completely agree with the basic idea here. I do think there is a difference between these "mean-well" men and those who don't even think about meaning well. It's all about expectations. The "mean-well" guys lead you to believe you can expect a bit more out of the, which is why they'll end up being more infuriating. The mean-well men are where things really get tricky. It's not to say their intentions aren't genuine, they just may change over time, or, as John said, explode in an outburst of selfishness. I'm a pretty selfless person so selfishness is one of those emotions I just don't know how to handle... And I have to say it's also a VERY unattractive quality. What I wonder is, are men always either a "mean-well" guy or a guy who doesn't even "think about meaning well?" Or do they go through phases in their life? Or does it change from situation to situation/woman to woman? "God doesn't give you the people you want, he gives you the people you need; to help you, to hurt you, to leave you, to love you, and to make you into the person you were meant to be." WWD just announced Anna Wintour's brain child, Fashion's Night Out, will be repeated in 2010! It's no surprise the global fashion event that revitalized the retail industry is due to make an encore performance. However, I would've preferred it to be in the near future. Say, in February? Right before F/W New York Fashion Week? Tomorrow, Mayor Bloomberg, Vogue, the CFDA and NYC & Co. are expected to reveal details of the event scheduled for Sept. 9th, 2010. We can expect next year's to be even bigger and better! This year, I had a chance to stop by Barneys, Calvin Klein and Dolce & Gabbana. Unfortunately, my assistant salary kept me from actually making a purchase, but who wouldn't have a wonderful time surrounded by beautiful clothing, champagne, live music and familiar faces?! I do my best work hungover. I have less brain cells to confuse the issue. I just saw the commercial. sweet million is sweeter than sweet!! I depend on friends/family and ads to remind me to buy tickets, although neither has proven to be very effective. With me, a lot of times things go in one ear and out the other. 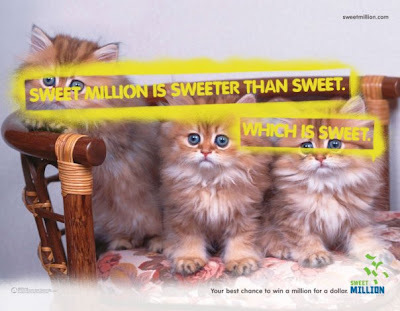 That being said, the ads for New York Lotto's latest game, Sweet Million, are EXTREMELY hard to forget. Telling me I can win a million dollars is one thing, using kittens and puppies to tell me I can win a million dollars... now that's a way to get a girl to pay attention! *Ads have not led to an increase (...or initial) purchase of Sweet Million tickets on my part. **Ads have led to an insane desire to own, cuddle, play with, steal and just love on kittens, puppies, bunnies, etc. So my last post, over two months ago, was obviously a lie. Most of you know me well enough to know that I'm a slacker. I procrastinate like it's my job. I'm not going to say I'm back this time, because it could very well turn out to be another lie, and I'm done giving false hope to all two of my followers. After a ridiculously long break full of fun and adventure, I'm finally back in NYC and attempting to blog again!! I've promised myself to check in at least twice a week, but hopefully I'll become addicted/inspired and stop in more often! I'm on fire tonight! I've applied to four jobs in the last hour. I'd be excited to at least interview, they all sound perfect for me. I'm just trying to keep my mind off the fact that they probably sounded perfect for at least 4,000 other people. I'm getting nervous. It's mid-August and I'm cutting it close. I'll officially run out of money mid-October. I don't even want to think about what would happen if I haven't found a job by then. As it is, I'm REALLY struggling. The past two months managed to simultaneously slaughter my savings and my cc's. Which brings me to my new backup plan - LOTTO. For years I've joked about my lotto backup plan. The one flaw - I've never bought tickets. Ever. I decided to finally put this plan to action. Today, I bought my first NY Lotto ticket! I figured this was as good a time as ever; my horoscope mentioned I would acquire a large sum of money soon. Here's hoping I'm tonight's big winner!!! Early Tuesday morning I received a call from a PR firm in Manhattan asking if I could come in for an interview. Needless to say, I am BEYOND excited. I've decided to pull an all-nighter to prepare for my interview and do some much needed cleaning. I was recently laid off from my job as a PR Assistant/Office Manager at C&M Media, a boutique fashion PR firm in NYC. I worked there for over a year. During that time I learned A LOT about the fashion industry. I would never consider myself a die-hard fashionista, you can spot those girls teetering on their Christian Louboutins a mile away, but I've really enjoyed working in fashion and, although my primary focus is PR, I hope that I can continue to specialize in fashion. My interview is at 11:30 tomorrow morning and I don't think I'm going to be getting any sleep tonight. I was asked to provide writing samples and my portfolio of media placements. Surprisingly enough, a year at C&M wasn't enough to provide me with either of these. I've decided to look through their client list and write up a few press releases based on the information I've found on their clients Web sites. I know I am the right person for this job and I'm not going to let the lack of a writing sample keep me from getting it! My ADHD kicked in. I'm about halfway through and I've decided it's time to take a break. My mom is coming tomorrow and I haven't even started to prepare. Time to do a little bit of cleaning! Today is my second day in the wonderful world of unemployment. I have to say, things have been going well so far. I feel as though I've reverted back to my post college jobless slump of 90210 reruns and unnecessary home improvement. Yesterday was slightly productive. I went to see my doctor and then spent two hours at Home Depot. It's hard to imagine how a girl living in New York City manages to spend two hours at Home Depot. Please note the miniscule 23rd St. Home Depot. After a year of living in my apartment I finally decided that I need curtains. I'm all for home improvement, until it comes to drilling. Thanks to Clebert, a lovely Home Depot employee, we figured out how to hang curtains without drilling. This is how I ended up spending two hours at Home Depot, and the overall outcome? Second attempt to come later in the week! Today was an equal mix of failure and procrastination. I attempted to fix my wireless router and after an hour on the phone with a very polite Indian woman, turns out it can't be fixed! Failed. As I sat watching Never Been Kissed for the 84th time, I decided to start this blog. I've decided it's time to start documenting my adventures in unemployment. I'm just hoping my adventures get increasingly more interesting!